How To Steam A Christmas or Plum Pudding In A Crockpot. Today’s post is dedicated to the process of steaming a Christmas pudding using a crockpot. When my mother cooked her puddings each year, they simmered for hours on the stove top, but I have found a fantastic, American solution for a pudding’s long cooking process. I fell in love with my crockpot many years ago, when I first came to America. It truly is a wonderful cooking appliance, perfect for steaming a traditional Irish Christmas pudding. My recipe for Irish American Mom’s Christmas Pudding is available on yesterday’s post and by clicking here. I decided to write a separate tutorial on how to steam the pudding, since otherwise, yesterday’s post would have gone on forever and a day. 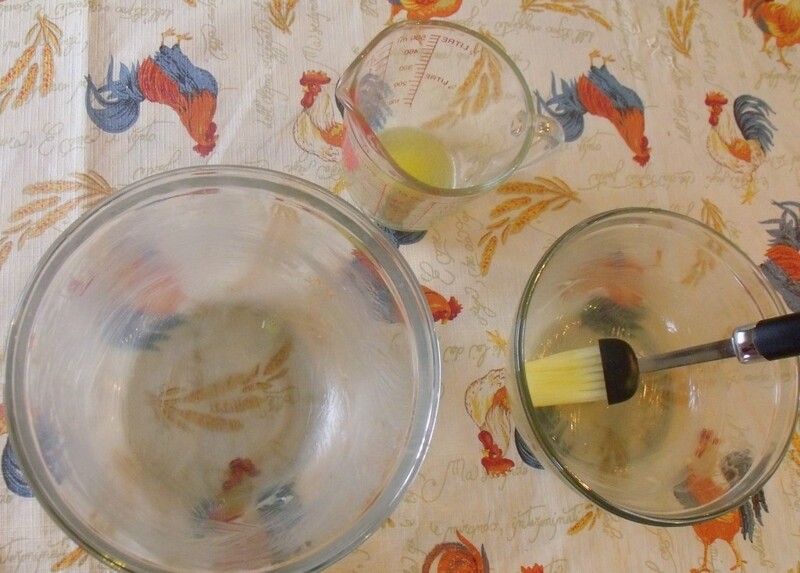 Grease two glass bowls by brushing them with melted butter inside. This recipe makes two puddings, a 1 and 1/2 quart size, and a second, larger, 2 and 1/2 quart size. I did this since glass bowls are usually sold in nesting sets, and most people do not own two bowls the exact same size. Make sure your glass bowls are heat resistant and can withstand immersion in boiling water. Fill each of the bowls with pudding mixture to within one inch of the bowl rim. About two-thirds of the mix will fill the larger bowl. The mixture is significantly less moist than when it was first mixed. Overnight, the dried fruit absorbs the eggs and Guinness, making them plump and delicious. Here is a side view of the mixture in the glass bowl. Next we have to prepare the bowl for steaming. 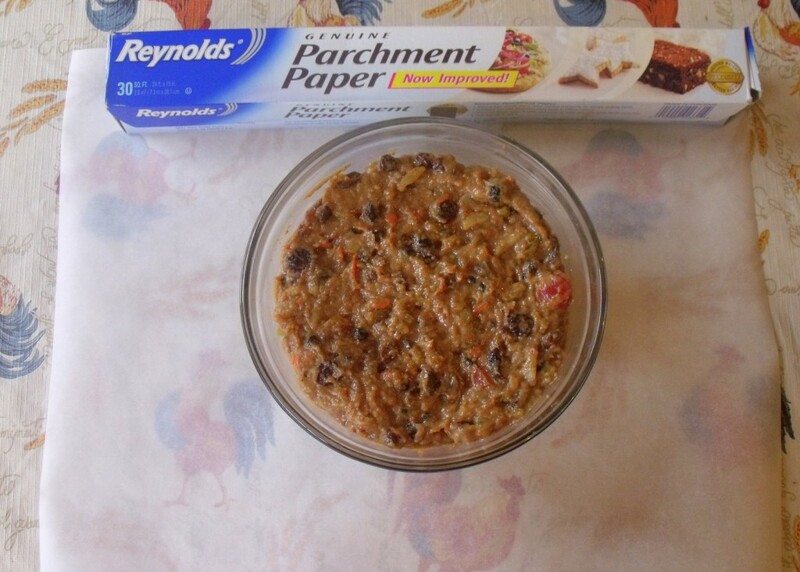 Cut a square of parchment paper around the bowl, allowing an extra 6 inches outside the rim of the bowl. 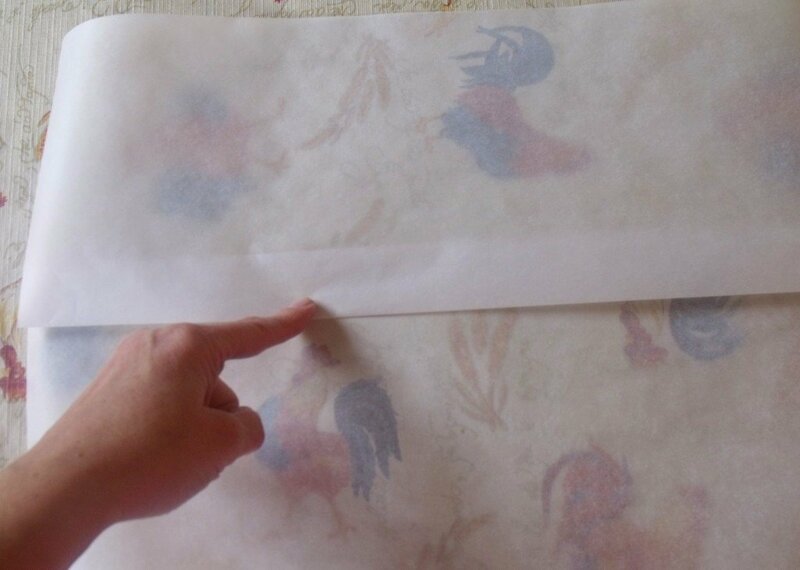 Create a fold in the center of the parchment paper. This will be placed over the center of the bowl’s diameter, and will allow steam to accumulate within the enclosed bowl, without bursting its paper bonnet. Cover the bowl with the parchment paper, with the fold over the center. 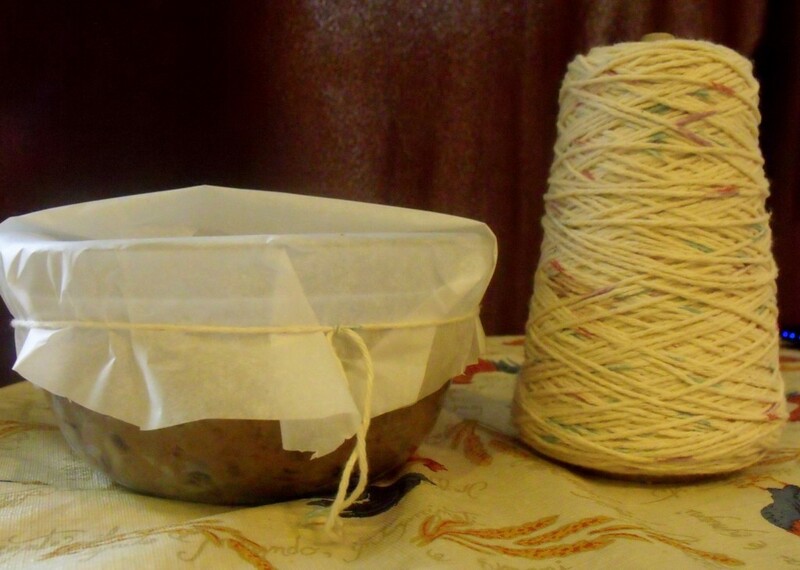 Using cotton thread or twine securely tie the parchment paper, just below the rim of the bowl. Make sure your thread is not made of nylon or a synthetic plastic fiber, since this could melt during the cooking process. Cut off any excess paper with a scissors. 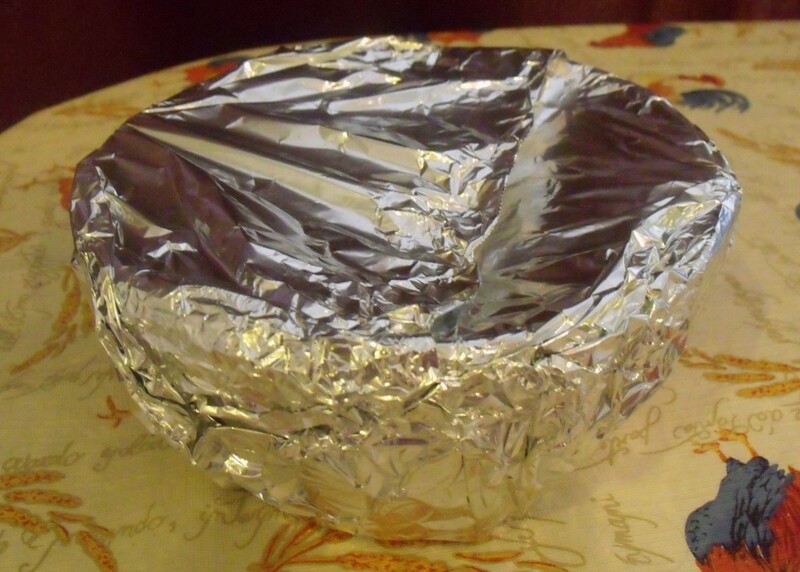 Now cover the entire bowl with aluminum foil, with the closure over the top of the bowl. Next, it is important to create a handle with cotton twine or thread, to facilitate lifting the bowl in and out of the crockpot. Place the bowl over the thread approximately 3 feet from the end. Bring the two ends of the thread towards the center of the bowl, then cross them around each other, just as would be done in tying a parcel. Working perpendicular to the first thread, work the two ends of the thread around the bottom of the bowl, returning to the center top to tie a secure knot. Now tie another knot 5 or six inches above the knot at the center of the bowl. This creates a looped handle for lifting the bowl. Place the bowl into the crockpot, making sure the edge of the bowl is at least a 1/2 inch from the walls of the crockpot basin. I use a 7-quart crockpot to cook the larger pudding, and a 4-quart one for the smaller pudding. 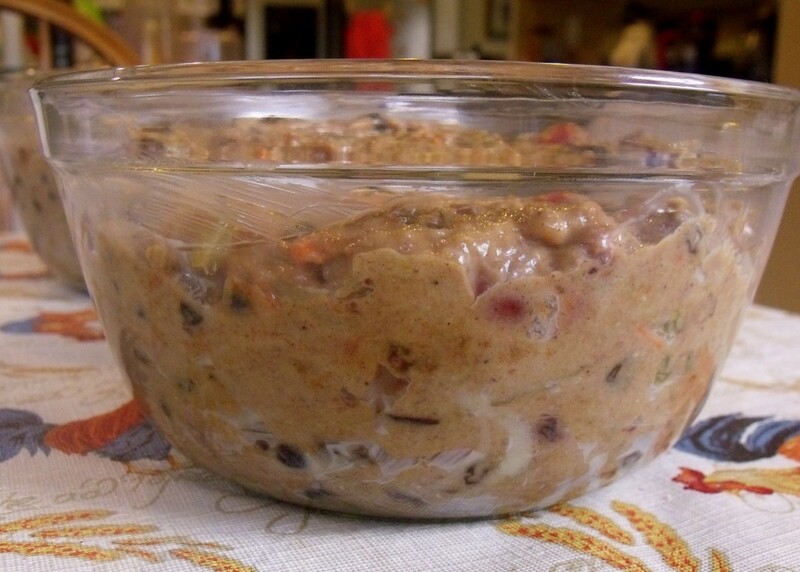 If you only have one crockpot, the second pudding can wait until after the first one has cooked. This mixture does not spoil quickly since it contains so much alcohol. Add water to the crockpot until it reaches three-quarter ways up the pudding bowl. Place the lid on the crockpot and turn to high for 1 hour. Reduce the heat to the low setting and continue to cook on low for 6 more hours for the larger pudding, and for an additional 5 hours for the smaller pudding. Check the crockpot about half way through cooking, to make sure all of the water has not evaporated. If the water level is very low, add some boiling water. Do not add cold water as this will slow down the cooking process. At the end of cooking, lift the bowl out of the crockpot using the handle created earlier. Use an oven mitt to protect your hands from steam. Do not open the pudding until after it has cooled for 2 hours in its wrapping. Remove the aluminum foil and parchment cover on the bowl. Take a deep breath and inhale the wonderful aroma of Christmas pudding wafting through the air. Stand back and admire the lovely fruited surface of your pudding. Next place a plate over the bowl with the serving side towards the pudding. Turn the plate and pudding over and let them stand for a few minutes. Gravity will take over, releasing the pudding onto the plate. Christmas pudding is best if made four to six weeks in advance of Christmas. It’s flavors enhance over time. Allow the pudding to cool completely prior to storing it. 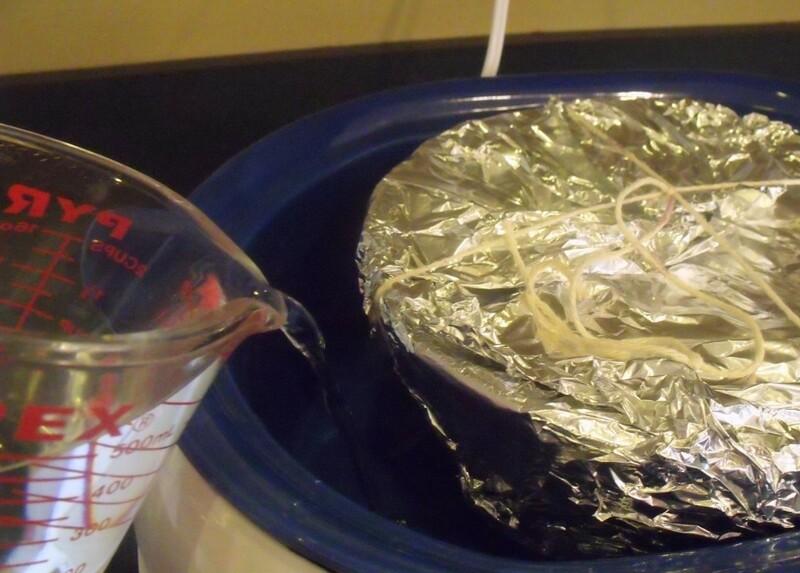 Cover it in aluminum foil and place it in an airtight container. These puddings can be stored for upto 3 months without spoiling. No need to freeze them. 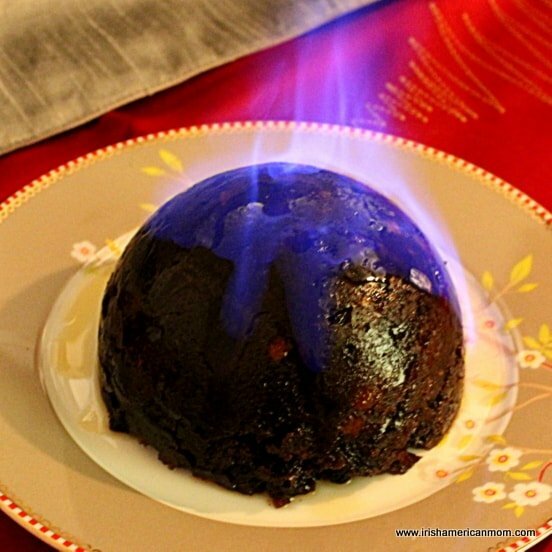 Christmas tradition involves setting the pudding alight before serving. If planning to do so, the pudding needs to be reheated. This can be done in a crockpot once again. First the pudding needs to be replaced into the steaming bowl, and prepared for steaming as outlined above. Reheat on the high setting for 1 to 2 hours in the crockpot. Christmas pudding is served with egg custard, whipped cream or, with my favorite, brandy butter. In the meantime, have fun steaming your puddings. If you plan on setting your pudding alight, why not check out my simple tutorial for setting your pudding ablaze. Here is the printable version of the complete recipe. Imen – I have a gas stove here in America, and like you I hated the thought of the pot over the open flame for hours on end. That’s when I decided to try my crockpot, and the results were fantastic. I might try to steam a summer fruit pudding in the crockpot too. 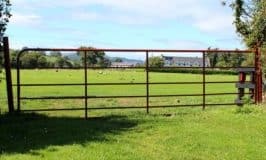 Mairead – I really enjoy your blog and your perspective on your bi-cultural life! Wish I could have met you at Celts on the River this year. If I want to make 4-6 smaller puddings, I’ll probably have to make two recipes, won’t I? If I make them in heat resistant 24 oz bowls, filled to within an inch of top, about how long will i need to steam each? Thanks for a great idea, and your help! Peg – Thanks so much for checking out my recipes and my blog. Hopefully we will get to meet someday soon at some Irish event here in Kentucky. My mother has cooked puddings in the oven before. To prepare the pudding she wrapped the bowl as I showed. Then she put two long strips of aluminum foil crosswise on top of the kitchen counter. Then she lay the baking tin or roasting pan she was planning to use on top of the foil cross. Next she placed the pudding bowl into the roasting pan and filled it with boiling water to just about an inch from the top. 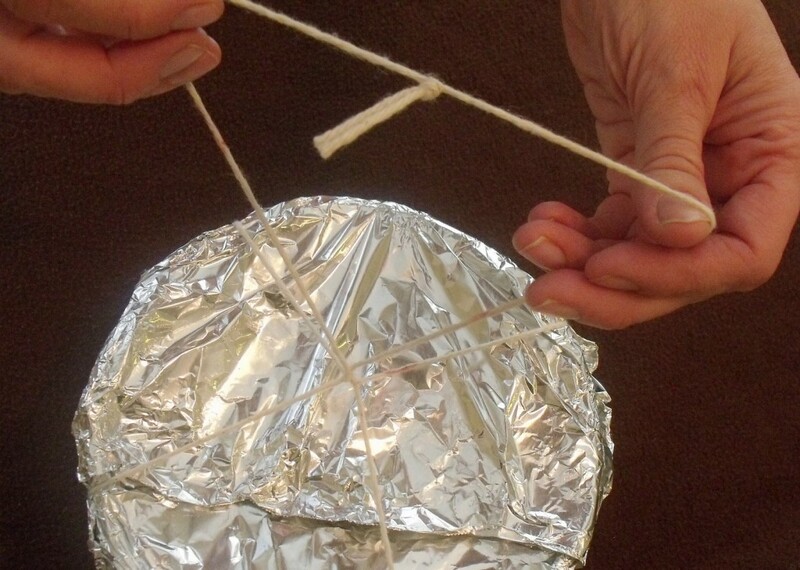 Next she wrapped the layers of foil around the bowl and roasting pan to form a parcel. 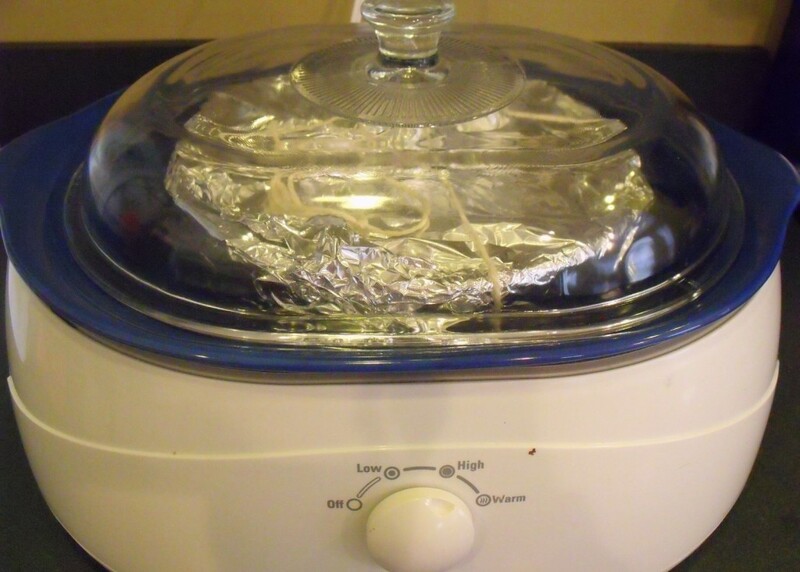 Use another layer of foil if needed to make sure it is airtight and to be sure steam won’t escape during the cooking process. She cooked it in a 300 degree F oven. Topping up with water during cooking is not necessary and is actually quite hard because all the steam would escape when you open the foil parcel. You might be able to fit two small bowls in one roasting pan and parcel them both together. Just make sure they are a few inches apart and not touching. I would guess 4 hours in the oven should work for these smaller puddings. The longer you cook them, the darker they get. I don’t like my puddings cooked for too long because the flavors can get very intense. 4 hours is my best guess for the size you are planning, but it is only a guess, since I have not made such a small pudding before. Best of luck with your Christmas pudding preparations. I’ll do a post on setting it alight and making different sauces for the pudding a few weeks before Christmas this year. I enjoy your blog so much. Thanks for sharing your family recipes. They sound wonderful. I’m planning on cooking your Irish Shepherd’s Pie with Guinness tomorrow for our supper. It looks delicious! I may try Christmas Pudding in smaller puddings to give as gifts also. I guess I’d better get busy. Jacque – Thanks so much for stopping by my blog and for your lovely comment. It is always wonderful to hear from readers. Hope you enjoy my Shepherd’s Pie with Guinness, and best of luck with your Christmas puddings. In a week or two I’ll add a post about how to light a pudding and another one on suggested sauces to accompany it. My mother always made frozen brandy butter to melt on top. Yummy!!! I am anxious to try your recipe. The pictures and instructions are wonderful. Just what I needed for my first attempt. Can’t wait to learn how to set it aflame and top it with your mother’s recipe for brandy butter sauce. 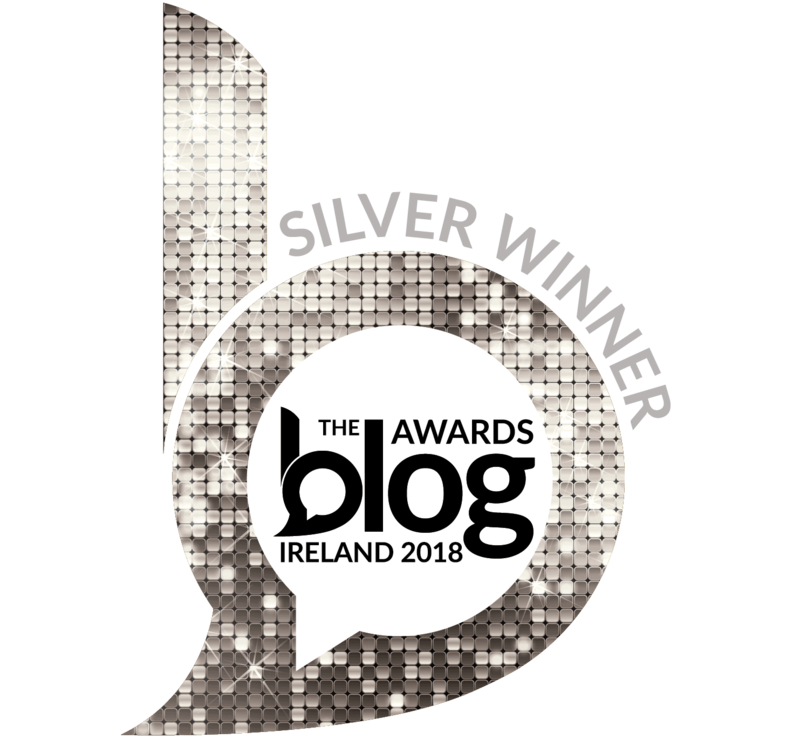 Congratulations on your award: your blog is truly exceptional. 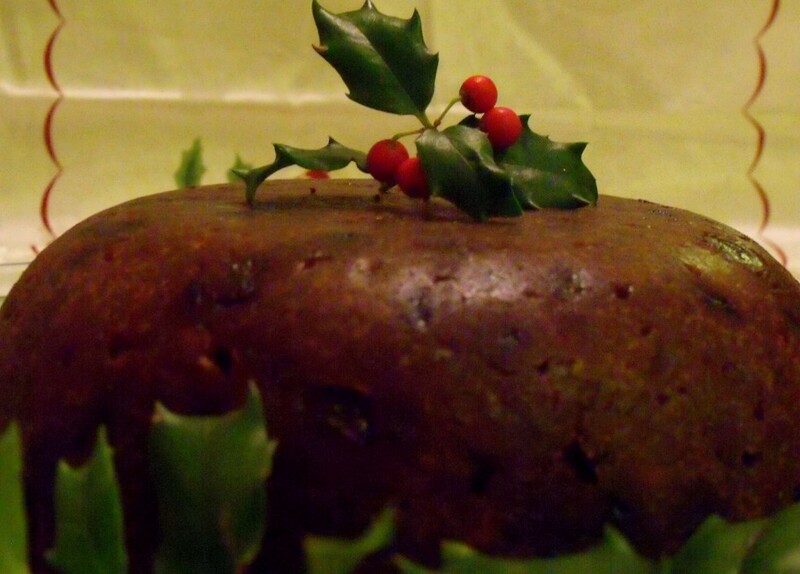 Anne – Hope your Christmas puddings turn out great, and thanks for your lovely comments about my website. It is lovely to hear that readers enjoy my recipes and stories. Take care and have a very Happy Christmas. I ran across your site while looking for an easier way to steam puddings. Thanks for the tip on crockpot steaming, I wouldn’t have thought of that but it is a lot easier. I’ve been making our family recipe for Christmas pudding for years now but this year I’m trying your version because it has so many different types of fruit and sounds yummy. I can’t wait to taste it & see what my relatives think. Thanks again for your tips and recipe! Sophie – Thanks for checking out my blog. I hope your Christmas pudding turns out great and that it meets with your family’s seal of approval. It is not as dark as some puddings since I don’t use treacle and a variety of fruits. Every year my husband looks forward to our pudding on Christmas Day. In a week or two I will share a post on sauces to accompany a pudding and another on how to set a pudding on fire. I don’t have a crockpot, can I cook it in a bain marie? If the answer is yes, how long should I cook it? Mariana – I have never used a bain marie, but my understanding is that it is a French steamer. It will cook your puddings slowly and a low heat also, so my best guess is that you will need to steam a larger pudding for 6 to 8 hours and a smaller one for 5 to 6 hours. Hope this helps and that they turn out well. Mariana – I checked it out online, and it really looks like a useful kitchen tool, perfect for steaming puddings. Thanks for letting me know about it. Dear Mairead, It has been a tradition in our Irish-English family to end Christmas meals with a flaming plum pudding and I have been the designated baker for over 30 years since my mother’s passing. I have always used her recipe which includes many of the ingredients you and your mother use; however, my recipe call for suet–which I have faithly used. I note there is no suet in your recipe. I do find currants in the stores here in Indianapolis–this year I had more trouble than usual. Iti is a wonderful tradition and I enjoy perpetuating it for our family gatherings! Glad to see you carry on as well! Happy 2013 and may we meet soon. Ruth – Most traditional pudding recipes call for suet, but when I was growing up my Mom just used butter instead. Our puddings have always turned out great without suet, so it is not essential. Meijers is the only shop where I can find currants here in Louisville. I devised this recipe before I came to Kentucky, when I had a lot of trouble getting currants in other parts of the US. Now I just make it without them. We too love the tradition of lighting a plum pudding on Christmas Day. 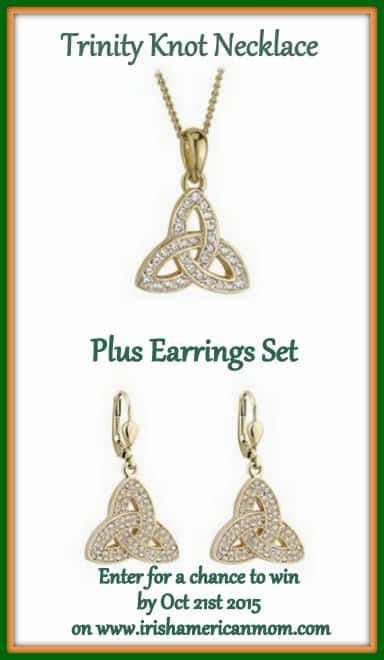 A little touch of Ireland to pass on to our children here in America. Best wishes for a happy and prosperous 2013. By chance I happened upon your web-site. I have made my own Christmas puddings for a number of years, developing my own recipe over time by cribbing from others recipes on the web and in cook books and by looking at the ingredients in some of my favourite commercially produced puddings. I am now quite happy with my results but am always looking to incorporate something else to enhance the flavour. I am now considering including orange marmalade as per your recipe but will probably pass on the pumpkin pie. Most of the other ingredients are much the same. I particularly like your idea of cooking in a slow cooker. So much better than on the hob and worrying about keeping water levels up. I shall try this next time. One area that I depart from you is the storage time. I make my puddings at least one year in advance. I include cognac and port, rather than Guinness, and ‘feed’ the puddings occasionally throughout the year/s. In my opinion, stored correctly, they can last for years and continue to mature. They taste superb. Lastly I am now looking at the ‘re-heating’. In the past I have steamed the pudding, which is something else to worry about on a busy day. I have always re-heated left over Christmas pudding the next day in the microwave and it’s fine. So this year I am planning to re-heat the original pudding in the microwave, taking my guideline times from commercially produced puddings which always include microwave cooking instructions. Many thanks and best wishes from the UK. Dear Andrew – Thanks so much for your kind words about my recipe and for all your wonderful tips for Christmas pudding success. It’s always wonderful to hear from readers and to learn from their cooking experience. Just like you, my mother has stored her puddings for over a year, but I have never been so successful in the United States. I think our warmer summers may have an impact on storage time, but perhaps I should feed my puddings with additional brandy, as you suggest. I confess I often reheat my Christmas pudding in the microwave, but I have always sliced it before doing so. The only time I go to the trouble of reheating one in my crock pot is when I want to set it alight. I’ve never tried microwaving a whole pudding. I would just like to add my appreciation to your well presented recipe. I have always made Christmas pudding according to my grandmother’s recipe, but haven’t done so since I returned to the UK, and was a bit hesitant about how to cover and boil the pudding. I also made the mistake of doubling the recipe, thinking the bowl I had was larger that my grandma’s original recipe. Soooo, I needed to use two bowls. The photograph of how to cover the bowls were so clear, I stopped panicking! My puddings should be finished in half an hour’s time. I so pleased I came across your website. I checked out a lot of others, but yours is sincerely the clearest. Thank you for sharing. Katherine – Thanks so much for your lovely feedback. I’m so glad my photo instructions were helpful. I hope your Christmas puddings are a great success. 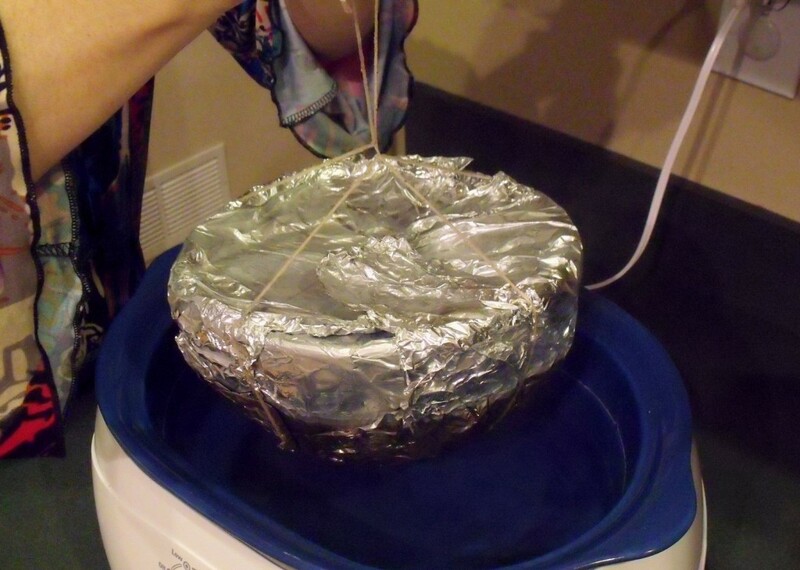 Hi Mairéad, Love this idea of cooking your Christmas pudding in a crockpot. I have used my grandmother’s recipe for the last few years, carrying on her tradition of cooking this recipe for over 70years of her life. She taught me the recipe when she was 99 years old & supervised my second effort with her recipe when she was 100years old. My question is: what success would I have using your crockpot method with her recipe? Are there any pitfalls or things I should watch out for or take in to consideration please? Hi Paddy – I think you should have no problem cooking your puddings in a crockpot using your Grandmother’s recipe. Once it is a fruit laden pudding, with porter in it, everything should work out fine. I’m so glad you were able to enjoy making her recipe under her direct supervision when she was 100. What a wonderful memory. Val – Cooking time will depend upon the size of the bowl you are using to cook the pudding. For a 1-quart size or less I would cook on high for 1 hour and an additional 4 hours on low. For a 1 and 1/2 quart size I would do 1 hour on high and an additional 5 hours on low. For a 2 and 1/2 quart bowl I would cook one hour on high and 6 hours on low. Hope your Christmas puddings turn out wonderfully this year. Thank you for your clear and easy to follow instructions! I am an American so the Christmas Pudding isn’t in my family’s traditions. My husband, however, is from New Zealand and misses his mum’s pud at Christmas dinner. Well… I have two little ones (just turned one and three) and just got around to dealing with the pudding issue. As a total novice I was wondering if my pudding will still be ok if it isn’t left to rest for 4-6 weeks. I have the mixture in the fridge now and was going to steam it tomorrow. Help please! And please pardon my embarrassing ignorance on this topic! Emily – Your puddings will be fine if they are cooked and eaten straight away. The weeks of storage serve to mature the flavors of the stout and spirits in the pudding, but the difference would probably only be apparent to a Christmas pudding expert. Hope you all enjoy your plum puddings and have a wonderful family Christmas together. I’m sure excitement is rising in your house. Just what I was looking for! 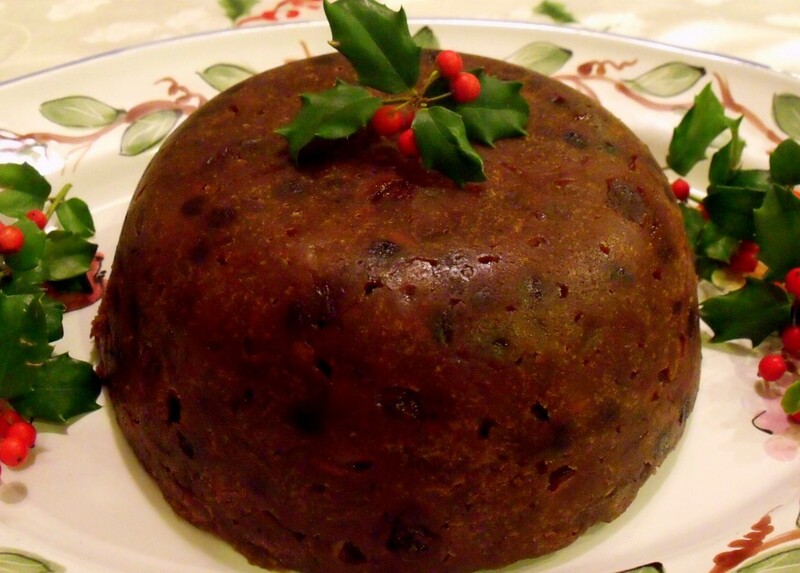 I want to make a traditional Scottish ‘Clootie Dumpling’ in my slow cooker and wanted to see how to steam a fruit pudding, I’ll definitely be giving it a go. Janice – I love my crock pot for steaming puddings. Glad you found this post to help with cooking your Scottish ‘Clootie Dumpling’. I hope it turns out delicious. Just turn it down to low for an hour and they should be fine. The first time I tried to cook one in a crock pot I steamed it for 9 hours and burned it a bit. If you’re worried just turn it off. If when you look it turns out a little undercooked you can give it three hours to reheat/finish cooking on Christmas Day. Many thanks for your reply. Left it for another hour and it turned out perfect. Put the other one in for 1 hour on high then 5 hours on low. Superb!!! Ellie – I’m delighted to hear your puddings turned out perfectly. Hi there! I’m making your pudding for the second time this year! I was wondering though… How long can I leave the mixture in the fridge before steaming? My crock pot won’t hold both tins. Thank you!! Emily – Once refrigerated the mixture should be fine for 48 to 72 hours, so you can let the mixture mature for 24 hours, then cook one pudding the next day and the final one the next day. Hope this helps. This might be a silly question, but can I use metal bowls instead of glass? I wonder if it makes a difference–burning, batter sticking to metal, etc.? Your recipe sounds absolutely stunning. 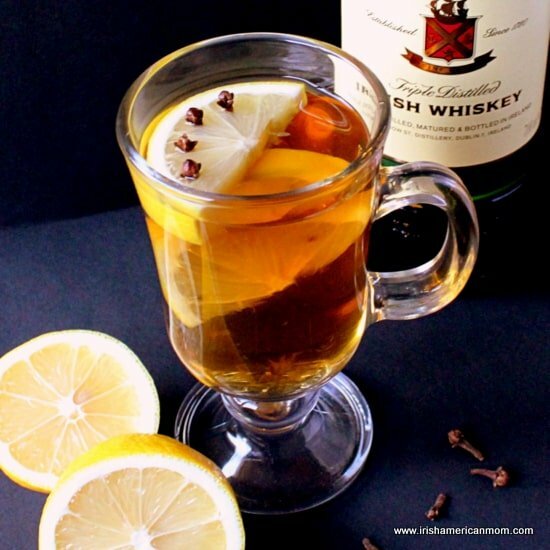 The ingredients seem to work perfectly together. I plan to serve one pudding at Thanksgiving and one at our New Year’s Eve party. Thank you so much for sharing the recipe in all its intricate details! Hi Emilia – I have only ever used glass bowls. I think metal would transmit too much heat and there would be an increased risk of burning the puddings. You could end up with a pudding that is underdone on the inside, but burnt on the outside. I hope your puddings are a great success and get pass your Thanksgiving taste test. I’m a transplanted Canadian of British heritage over in America and I lika a wide variety of cuisines, but I like them easy. This year I decided to make tamales, again! I haven’t done it for a few years, but every so often I get a hankering. Anyway, I have decided to make them in the crock pot. That is not too hard. but I also like sweet tamales. I have already made about 4 dozen pork tamales (they freeze and reheat beautifully). I also love to make sweet ones, but I am tired of making Tamales. It is very time consuming, though not difficult. That is when I began to wonder if I could steam them like our wonderful steamed Christmas puddings. Thank you so much for the post and tutorial. I’m going to line the dish with the corn husks, and cover with the pudding husks before using the foil cover. I think it will be brilliant. Happy Holidays everyone! Best of luck with your tamale steaming in your crockpot. Thanks for letting us know your plans – the crockpot really is a versatile tool. 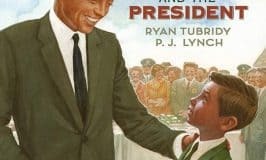 Technical question! Has anyone ever tried baking a steamed crockpot pudding WITHOUT the wax paper and foil cover? I am asking because I’ve baked cakes in my crockpot by switching out the crockery insert with a bundt pan insert. The lid fits snugly on top and the cake turns out extremely moist. I am wondering if the tight inner pan cover is needed. I have never tried this technique, but it sounds very interesting. Here’s hoping some other reader can let us know if this might work. 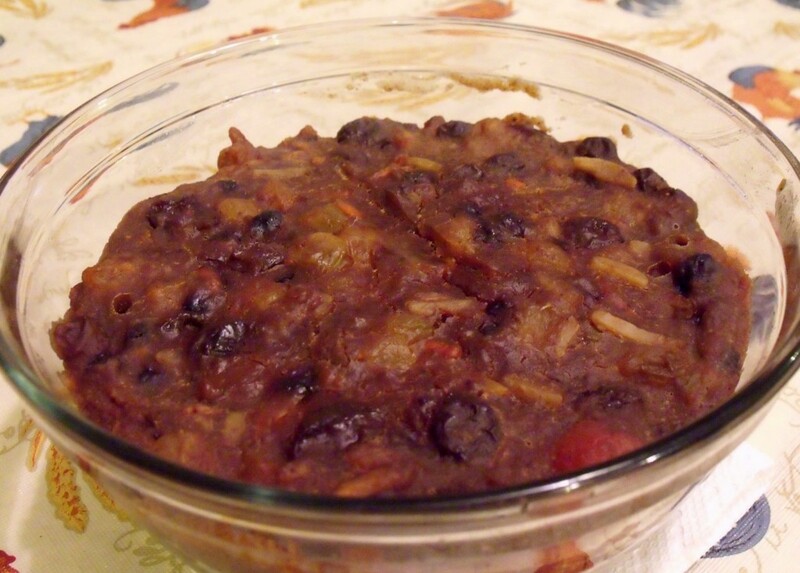 Hi Ina – Thanks so much for checking out my crock pot recipe for cooking Christmas puddings. I have always used a glass pyrex bowl when making my Christmas puddings. If your Christmas pudding baking pan is in a bowl shape then I can think of no reason why it wouldn’t cook well in a crock pot. I know there are Christmas decor pans available, in shapes like Christmas trees and stars, and I wouldn’t risk one of those in a crock pot.It would be difficult to cook them evenly and create a foil package around them. Anyway, I hope this helps and that your very first Christmas puddings will be a great success. Hi Ina – Your pudding looks amazing. I’m so glad to learn of your pudding steaming success and that my tips were helpful to you. Thanks for linking back to my site from your blog. Happy Christmas cooking. 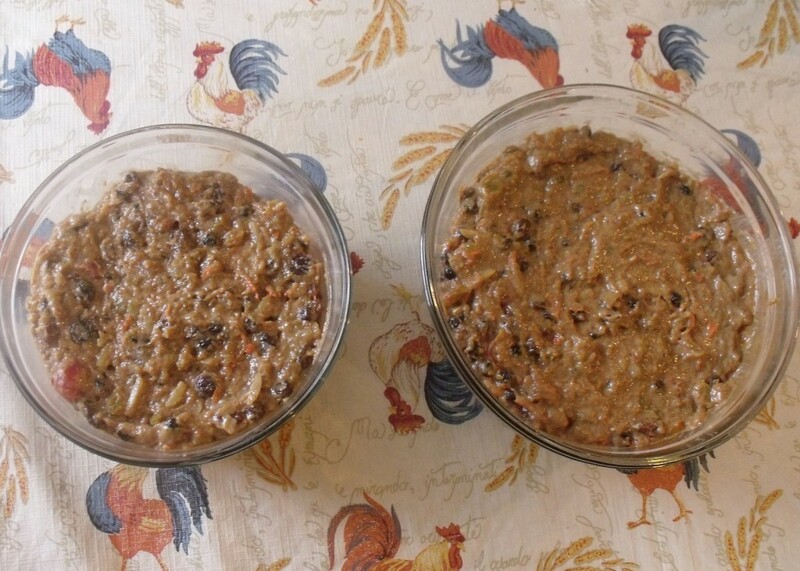 Hi Maureen – Christmas puddings make our family’s Christmas complete. I so look forward to my Christmas Day dessert. glad to hear your puddings are steamed and stored, and maturing nicely for the perfect Christmas feast. I like your mother’s advice to say a Hail Mary before removing the pudding from the bowl. And a prayer to Nana in thanks for her recipe is a great idea too. 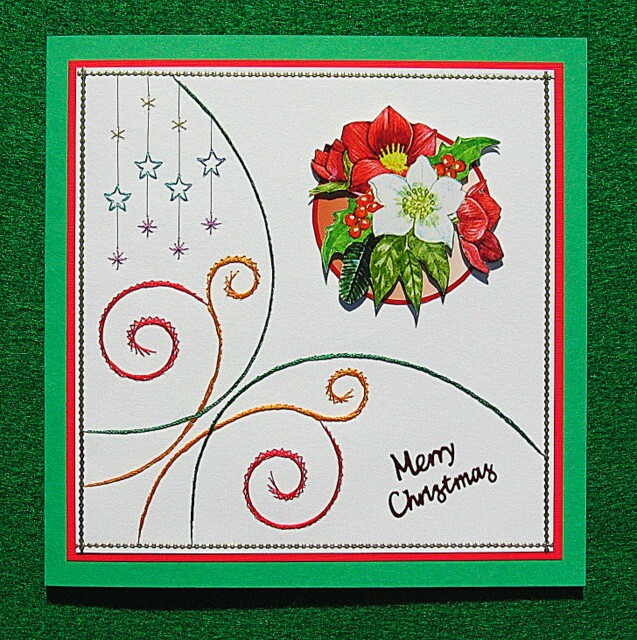 Have a wonderful Christmas, and thanks so much for checking out my blog post. I have a question for you, do you place a plate or something on the bottom of the crock pot to keep the pudding off the bottom. Hi Kevin – When I cook my puddings in the crock pot I just put the bowl right into the crock pot. However, if you are worried that the bowl might crack or damage the crock pot, you could create a trivet using aluminium. 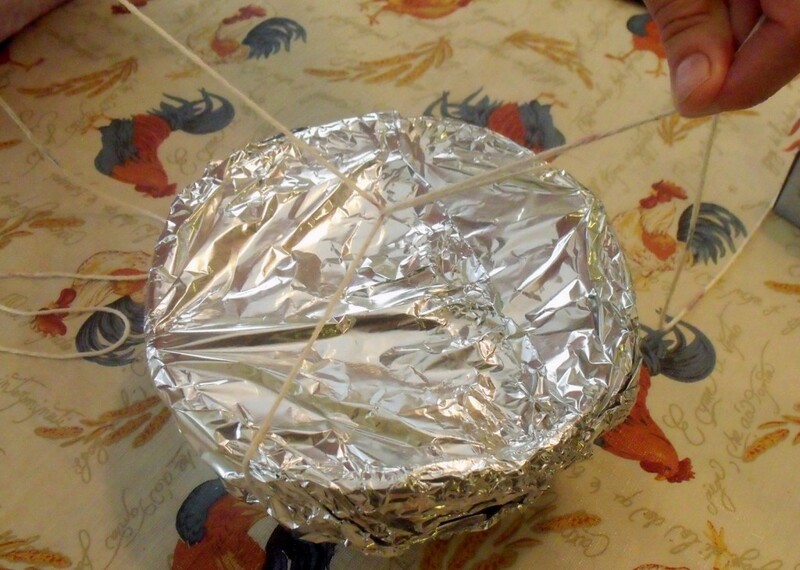 This is a circle of crumpled aluminum foil that you can sit the bowl upon before adding the water. I hope this helps. Hi! I made my first Christmas Puddidng yesterday, it came out perfect! It tast so good! I will make anther one next year 🙂 Now on to the Sheppard Pie! Hi Debbie – I’m delighted your first Christmas pudding was a great success. Best of luck with your Shepherd’s Pie. I have been steaming my Christmas pudding for 20 years, a wonderful way to save time and no need to worry about topping up the water as in the old traditional method. Hi Maria – Since there is so much alcohol in the pudding mix, the cooked puddings are preserved in the airtight containers even when stored at room temperature. They can keep for up to 3 months outside the fridge because of their alcohol content. That being said, I would still keep them in a cooler pantry or kitchen cupboard, and not in a room that is kept at a very high temperature. I hope this helps and happy cooking. Thanks for checking out my recipes, Meg.